By this episode the show was set in the mid 1960s, so this spoke to an obvious generation gap. Both characters are right, in their context. Music has always been important. It just wasn’t until the 50s and 60s that it became a dominant cultural force that informed and influenced millions of people. Radio and records and other advancements of technology, as well as the vast expansion of youth culture, made this possible in ways that people of Don Draper’s generation just couldn’t quite comprehend. This has been true for fiftyish years, with The Beatles appearance on Ed Sullivan as the hundredth monkey tipping point that changed the world in this regard. I’m sure a quick Google perusal of the internet will turn up thousands of articles about the larger cultural ramifications of this. The point has also been made that this is something that is specific to this moment in time and that in many ways we have already moved past it. That isn’t meant as a ‟Rock is Dead!” declaration. It’s an acknowledgement that the world has kept on moving and that the cultural forces that led to this are no longer present. The internet has changed the way we consume music and interact with those who make it. For all the success of a Lady Gaga or a Justin Bieber it just doesn’t seem like any of the current batch of stars have the social relevance or staying power of the artists who preceded them. I know how much that sounds like an old guy decrying ‟Back in my day!! !” but that’s truly not my intention. I want new artists to succeed. More importantly I want young people to have the same kinds of joyous experiences with music, live and otherwise, that I have had. I don’t know if that’s possible anymore, for much larger reasons than the cliched and wrong-headed opinion that they ‟just don’t make good music anymore.” I just don’t think there is the same kind of infrastructure that will allow for a David Bowie, or a Madonna, or a U2 or an REM to emerge, let alone enjoy the longevity and social relevence of these and many other artists. I hope I’m wrong. I’m currently reading a book of essays by Chuck Klosterman called ‟But What if We’re Wrong?” that addresses the idea that in the future everything we think we know about the present will be wrong. The things we think are important now will be seen through the eyes of history and retrospect with a much wider perspective than we are currently capable of. As proof of this he reminds us of the way we interpret history now. Van Gogh and Kafka were failures in their lives but now one is the most famous artist ever and the other has joined the very framework of our language as an adjective. Custer was once seen as an American hero. Now he’s thought of as a genocidal maniac. Try convincing a farmer in the Dark Ages that we live in a heliocentric universe. The world keeps turning and our reality keeps changing around us and for the most part, in our limited time here and limited sense of perspective, we just don’t notice. We assume things will always be the way they are until they aren’t. I can’t imagine a world without pop music and the music industry in it, but then one hundred years ago people couldn’t imagine a world with instantaneous global communication. Or one without polio. So Rock and Roll, and all of the variations of popular music associated with it, for all of its importance to those of us who care, may be a minor blip in the course of history, generating little more than a footnote in whatever passes for a college textbook in the year 2112. The thing is, this is true for pretty much everything we currently engage in. No matter how much we love something, no matter how much we think it is an essential part of our culture, no matter how much it defines our lives (I’m looking at you, sports fans), history says it not only won’t last but will probably be marginalized and misunderstood by future scholars. So, if we accept this nihilistic point of view, why get really into anything other than the mechanics of survival? I’ll get back to that. I am certainly part of the generation that was born into a world where music has always been a defining cultural artifact, and I’m very aware of how this has shaped and influenced my way of interacting with the world. For me, like Megan said, music has always been important. And by important I mean in ways that go well beyond simply liking a song. I am admittedly a music hobbyist who engages with it in a less-than-casual fashion. I continually look for new music. I get obsessive over musicians and want to know about them as personalities, looking into their lives and biographies much deeper than most people do. Music has always been a soundtrack to my day-to-day that went beyond just being in the background. I grew up in an incredibly rural area. My parents were in their early 40s when I was born. My paternal grandmother, who lived with us, was born in 1884. I was surrounded by adults who had grown to adulthood in a very different world than the one I would come to inhabit. Until I was twelve I lived in a small two-story six-room house of bare, unpainted wood with a tin roof. We did not have running water. There was a hand-dug water well with a hand pump in the front yard and an outhouse in the back yard. I’m not complaining here. I actually have very good memories of growing up there and I believe those circumstances taught me valuable life lessons. But something in me yearned for more. Comic books and music were the twin explosions of color in my sepia-toned Appalachian youth, and they have always had a natural association in my mind. Comics took me to cities and other countries and other planets and other dimensions. The colorfully costumed heroes taught me to dream bigger dreams and to imagine a world beyond the confines of the hollow I grew up in. Music was always present in my home. Dad had played guitar and mandolin in a Hillbilly band with his uncle and cousins when he was young. His mother played piano and the accordion. That whole side of the family had musical talent, but because of age I never really had the opportunity to experience it first-hand. But there was always a radio in the house, usually tuned to WWVA from Wheeling, West Virginia, home of country music. I remember latching onto songs like Tiger by the Tail by Buck Owens, and Folsom Prison Blues by Johnny Cash, and Counting Flowers on the Wall by the Statler Brothers (probably because they name-checked Captain Kangaroo, who I was big fan of when I was four). These are overt memories for me. I was into songs. The British Invasion and the Beatles and the whole eruption of the music industry in the 60s began to be woven into the fabric of everything aimed at youth. 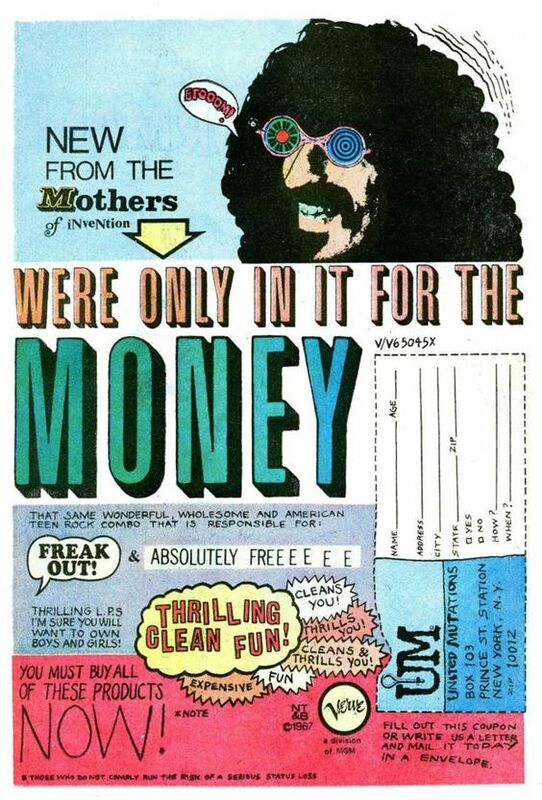 I saw ads for Frank Zappa and the Mothers of Invention in comic books. The image of the T.Rex album The Slider stands out as an image that stared at me from the double page ads for record clubs I saw in every comic. The Beatles had a Saturday morning cartoon. So did the Jackson 5. The Monkees were a weekly live action pastiche of Beatles inspired frenzy. The Banana Splits, Josie and the Pussycats and the Groovie Ghoulies had weekly music videos interspersed with every episode. The cartoon version of the Archies had the #1 hit song in 1969 with Sugar Sugar. This hit launched Bubblegum Pop which led directly to a lot of what became the Glam Rock movement in Great Britain. David Bowie and Elton John were singing about Spacemen. Alice Cooper was a horror comic come to life and KISS were simply superheroes from the first time I saw them. I engaged in fannish activities well before I could afford to seriously begin collecting albums. On our trips into town I not only bought comics (always), but I also started to pick up copies of teenybopper music mags like Tiger Beat and 16. I read the articles and hung the posters that came with the mags on my bedroom wall. The Osmonds and the Jackson 5 and David Cassidy and probably many others (hands up... who remembers Tony DeFranco and the DeFranco Family and their ‟big” hit, Heartbeat, It’s a Lovebeat?). I think I was trying to identify with the larger than life qualities of these performers more than having crushes on them. I never entered a ‟Win a Date With...” contest. I would run around outside pretending I was a superhero from the comics, and lip sync in front of mirror pretending I was a young pop star. I started buying the singles I heard on the AM radio stations. Over time I moved on to FM radio and much better music. Without the guidance of an older sibling I missed the glory days of Led Zeppelin and Black Sabbath and many others of that period. The truth is I think Sabbath would have simply weirded me out back then. I’m also very aware of how the bands I ended up really getting into had that extra element of the visual. Superheroes and Rock and Roll. Deep Purple was an awesome band, but they were a bunch of dudes with long hair and blue jeans. I could see that anywhere. Did you see what Elton John was wearing? That’s a trend that has never really gone away for me, not completely. F-f-f-Fashion! My musical tastes now span a pretty wide cross-section of genres and styles, but I always come back to the performance and glamour. The Sweet, Queen, and Cheap Trick all fell into this category for me as the 70s roared on. Adam Ant, wearing Indian warpaint, a colonial greatcloak and a tri-corner hat caught my eye on Solid Gold and I was hooked. I wasn’t aware of Bauhaus until years later but if I had seen the videos of their live performances in 1979 I would have been all over that. Strangely the Hair Metal of the 80s didn’t grab me at the time, in spite of the over-the-top costuming and makeup. I think once KISS took the makeup off I just felt done with that style. This coincided with a general malaise I was feeling at the time for the styles of music I had been listening to. It’s no surprise to me now that this is when I first discovered Bowie’s Berlin period through Heroes and started down a path of Punk and New Wave and College Rock. I discovered lots of new bands I loved; The Replacements, The Pixies, Love and Rockets, Nick Cave and the Bad Seeds, The Jazz Butcher, PJ Harvey, and many, many more over the next thirty years. I bought a lot of vinyl and then replaced most of it on CD. I went on obscure tangents to the extent that an awful lot of the popular music of the 90s remains pretty peripheral to my life. I go back and reclaim things I lost and go back and discover things I missed. But it seems I’m always looking for that new, favorite band. Something new I can get into with the same enthusiasm I used to, though that seems increasingly difficult. Age and jaded tastes and feeling like I’ve heard it all before gets in the way. I have moments of this, still. I was crazy into the White Stripes, but then lost interest pretty quickly. I was pretty obsessed with PJ Harvey but I now admit that her last few projects just haven’t resonated with me. Call me fickle, but she’s an old love now, one I can go back to for comfort and familiarity. But I crave the excitement of the new. I have a new favorite band that, at least right now, are hitting all of the marks. TheStruts are a modern Glam Power Pop band from Derby. The band features Adam Slack on guitar, Jed Elliot on bass, Gethin Davies on drums and Luke Spiller on vocals. Now I want to say upfront that they’re probably not doing anything very new, but they are doing it very, very well. The songs are fun, hook-laden, and anthemic. Pretty much every song on their recent debut album, Everybody Wants, is a catchy, earworm singalong. That’s not a complaint. The album simply fills me with energy and makes me happy. 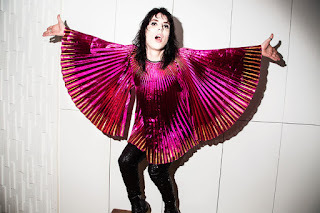 Their image, specifically as embodied by Spiller, is full-on Glam Rock. I saw them on The Late Show with Steven Colbert and then watched a couple of videos and knew immediately that I was hooked. As luck would have it I turned on to them about a week after they played a show in Pittsburgh. I figured it would be ages before I had an opportunity to see them. A few weeks after that they announced a show at the Rock and Roll Hall of Fame in Cleveland. That’s two-hour drive from here, and believe it or not I had never been to the Hall of Fame. So I decided to make a day of it. On their website, when they announced the show, they also announced a contest for a VIP Meet and Greet as well as tickets to the show. I never enter online contests but I thought, why not? Seeing the Struts in this venue, surrounded by this history, felt right to me. It’s difficult for me to say this without sounding like I am exaggerating, but I kind of feel like I had waited my whole life to see this show. The energy, the songs, the costumes and spectacle. It was simply one of the best concerts I have ever seen, and Luke spiller is genuinely one of the best and most engaging front men I’ve ever witnessed. I don’t say that lightly. I’ve seen a lot of concerts. I’ll try to put it in perspective. What I want and expect out of a concert depends a lot on my expectations. I’ve seen Lloyd Cole perform, just him and a guitar, several times. I love his songs, I love his voice, and what I want out of his show is very different than what I want from a different kind of band, and I’ve never been disappointed in him. I’ve been lucky enough to see a lot of bands I really like in very small, intimate venues and have been privileged to meet many of them. But deep down, where the kid who discovered Rock through School’s Out and Rebel, Rebel, and Rock and Roll All Night still lives, when I see one of these bands, I want to see a show. I’ve seen Alice Cooper... a lot. I’ve seen KISS a number of times. I saw David Bowie. I saw Queen in 1979. They were all amazing shows, including all of the music and spectacle I love. In every one of those cases though, I only saw them after they had become huge, in giant venues. For a few of them I was close to the stage, but for the most part they were always at a remove from the audience. 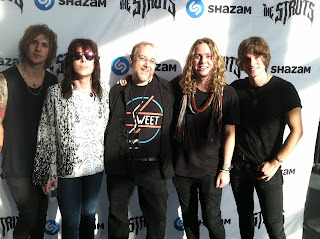 For The Struts I felt like I was getting to see them early in their career. Early enough for it to be a much more intimate experience than I’ve ever had with these other bands I mentioned. It felt like I imagine it would have felt to see Queen in 1974, or Bowie right before Ziggy Stardust blew up, or Alice Cooper at the Whiskey in Los Angeles. I can’t really say anything about Luke Spiller that hasn’t been said in the rock press. He looks the part of Glam Rock star, a visual cross between Freddie Mercury and a young Tim Curry. His voice has amazing power and range. You can hear elements of Mercury, as well as a touch of Noddy Holder from Slade (to my ears, anyway). He went through several costume changes over the course of the show, clothes, I discovered later, that were designed for him by Zandra Rhodes, who designed costumes for both Freddy Mercury and Brian May. He commanded the crowd, leading sing-alongs and cheers, making it impossible not to have a good time. For one of the encore songs, a nice ballad, he left the stage, waded into the audience, and convinced everyone to sit on the floor around him as he sang. He was the focal point, but the whole audience was the show. Photo by Amy Lombard. New York Times. Not that the rest of the band was forgotten. They were tight and on cue and every member got his moment in the spotlight. Not an easy task given their leader’s glowing charisma, but you walked away knowing that you had seen a band and not a solo performer and some backup musicians. 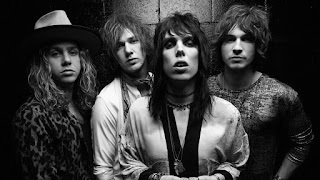 They've opened for The Rolling Stones and as I'm writing they're scheduled to open for Guns 'n' Roses, so they're getting the opportunity to find a huge audience. Will they last? Will they ever be as big as Queen or Madonna? Probably not. That’s a long shot under the best of circumstances, and as I’ve said I don’t think our current paradigm allows for that to happen anymore. Will they be remembered in the year 2112? Does it really matter? I haven’t been this excited for a new band in many, many years. I want to hang posters of Luke and the rest of The Struts all over my walls. I want to smear gold makeup on my cheeks and lip sync in front of my mirror. It’s not just about recapturing my youth (though some of it undoubtedly is). It’s about living in the moment. Enjoying our time before it is lost to history. Engaging with the things that bring you joy (yes, even sports), because life is hard and the best thing we can leave the future is a life well lived. We have this moment and nothing more. The past is only nostalgia if you aren’t living now. The future will come and wipe it all away, but live and love and laugh because in this moment we are alive. Do you love it, right now? Then it matters, right now. Labels: Adam Slack, Chuck Klosterman, Gethin Davies, Jed Elliot, Luke Spiller, music, Rock and Roll Hall of Fame, The Struts, What if we're wrong?